� the Australian Government�s $230 million Cyber Security Strategy includes $30.5 million to support the growth of Australia�s cyber security industry capability through the establishment of the Australian Cyber Security Growth Centre, AustCyber.... The Strategy captures this breadth of interests and articulates Australia�s approach across the full spectrum of cyber affairs. Australia remains committed to a peaceful online environment. The activities of states in cyberspace have implications for us all. As part of the Australian Government's Cyber Security Strategy (Department of the Prime Minister and Cabinet 2016), the Australian Cyber Security Centre (ACSC) provides information on threats to business arising from online transactions, including identity crime. 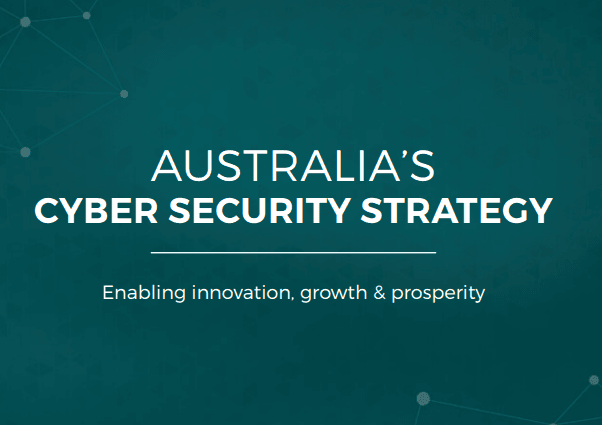 � the Australian Government�s $230 million Cyber Security Strategy includes $30.5 million to support the growth of Australia�s cyber security industry capability through the establishment of the Australian Cyber Security Growth Centre, AustCyber. The 2016 Australian Cyber Security Centre Survey (PDF) validates our understanding of the unrelenting and increasingly sophisticated cyber threat that we face every day. It confirms that many Australian organisations are experiencing some form of attempted or successful cyber security compromise, and that some are being targeted up to hundreds of times per day.